In a small bowl, mix together the soy, mirin or honey, and cornflour paste. Heat the oil in a wok or large frying pan. Season the beef and sear in batches, then remove to a plate and cover with foil to keep warm. Fry the garlic and chilli, then add the spring onions and beansprouts, and stir-fry for 2 mins. 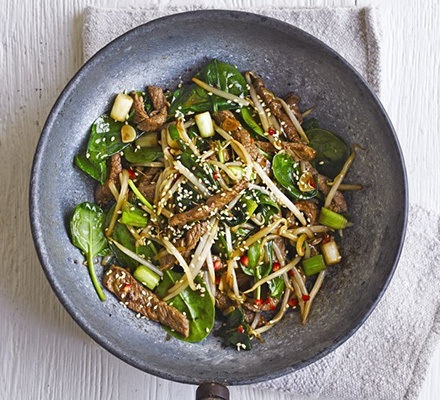 Return the beef to the wok and add the spinach along with the sauce. Keep stir-frying for another 2-3 mins until the spinach has wilted. Serve sprinkled with the sesame seeds and some rice, if you like.